Its a special day for both of us. Even though I am not by his side to celebrate together with him but my heart is with him now. Am going back to Miri tomorrow. Today I eat sweet potato for two meals.So nice~~. Mummy knows that I love sweet potato and she bought a lot. I promised the KK trip post but I havent figure it out how to share my story. 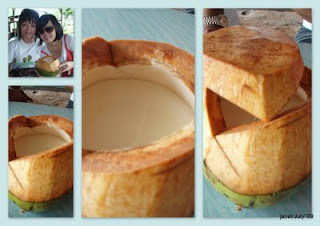 This is the coconut pudding that I tried during the trip. The size of the pudding is the same with the size of the coconut.So can you imagine how big it is? Its very cheap too.I think one coconut is RM2~Rm3.50.A must try o. That day I shared one coconut with my housemate ,Tien Tien. If I was not saving my stomach for the lunch,I think I can finish one coconut pudding too. So next time,I would go back for that coconut pudding again. For those who likes coconut flavour,you will definitely love it. I luv this pic and its taken by myself.Non-edited version. That was on the day 5 of the trip. I will find time to update about the trip.Kinda lazy seiously.hehe.